The program will be followed by a Q&A and a reception, and is presented in partnership with the Jewish Art Salon. Ticket price: $8 adults, $5 students and seniors. Program length including discussion: 90 minutes. 44 Park Place is near Church Street. 2/3 train to Park Place, A/C train to Chambers Street, E train to World Trade Center, N train to City Hall, 4/5 train to Fulton Street. 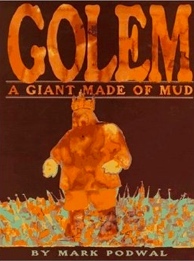 In Jewish folklore, a golem is an animated anthropomorphic being, constructed in the form of a human and endowed with life; its purpose to ward off anti-Semitic attacks. In conjuncture with Faith & Form, the current exhibition at The Anne Frank Center USA, artist Mark Podwal and author Thane Rosenbaum will explore representations of the golem legend in words and images. Mark Podwal, whose sketch of the golem is included in the exhibit, will present an illustrated lecture exploring how succeeding generations have recreated the golem legend to suit the times. The lecture will touch on the first mention of golems in Biblical and Talmudic sources, the origins of Prague’s golem legend, the transformed image of the Prague golem from servant to protector in the early 20th century, and numerous depictions of golems in book illustration, fine art, and film, including The Simpsons TV episode, You Gotta Know When to Golem. More info on the Faith & Form exhibit here. Mark Podwal is the author and illustrator of numerous books. Most of these works – Podwal’s own as well as those he has illustrated for others – typically focus on Jewish legend, history and tradition. His art is represented in the collections of the Metropolitan Museum of Art, the Victoria and Albert Museum, the Fogg Art Museum and the Library of Congress. Podwal is the author and illustrator of Jerusalem Sky: Stars, Crosses and Crescents; A Sweet Year; Doctored Drawings, among others. King Solomon and His Magic Ring, a collaboration with Elie Wiesel, won a Silver Medal from the Society of Illustrators in 1999 and You Never Know, his collaboration with Francine Prose, won a National Jewish Book Award in 1998. In 1996, the French government named Podwal an Officer of the Order of Arts and Letters. Beyond his works on paper, Podwal’s artistry has been employed in an array of diverse projects, including the design of a series of decorative plates for the Metropolitan Museum of Art. His work has been engraved on a Congressional Gold Medal and woven into an Aubusson tapestry that adorned the ark in the main sanctuary of Temple Emanu-El in New York. Moreover, he designed sixteen kiln cast glass windows for the United Jewish Appeal Federation Headquarters. Podwal is represented by Forum Gallery, New York. Thane Rosenbaum is an essayist, law professor, and the author of the novels, The Stranger Within Sarah Stein,The Golems of Gotham, Second Hand Smoke, and Elijah Visible. His articles, reviews and essays appear frequently in The New York Times, Wall Street Journal, Los Angeles Times, Washington Post, and The Huffington Post, among other national publications. He moderates an annual series of discussions on Jewish culture and politics at the 92nd Street Y. He is the John Whelan Distinguished Lecturer in Law at Fordham Law School, where he teaches courses in human rights, legal humanities, and law and literature, and also directs the Forum on Law, Culture & Society. He is the author of The Myth of Moral Justice: Why Our Legal System Fails to Do What’s Right. He is the editor of the anthology, Law Lit, from Atticus Finch to “The Practice”: A Collection of Great Writing about the Law. His forthcoming book is entitled, Payback: The Case for Revenge. Founded in 1977 by Anne’s father Otto, The Anne Frank Center USA, a partner of the Anne Frank House, uses the diary and spirit of Anne Frank as unique tools to advance her legacy, to educate young people and communities in the U.S. and Canada about the dangers of intolerance, antisemitism, racism and discrimination, and to inspire the next generation to build a world based on equal rights and mutual respect. Through a variety of innovative education programs and exhibitions, the Center uses Anne Frank as a role model for today. Her insights and courage continue to inspire students, educators and citizens more than 60 years after her diary was first published. The Jewish Art Salon catalyzes contemporary art with Jewish themes. The Salon is an innovative and global community of artists and art professionals. Since 2008 it organizes bi-monthly meetings in the New York area to provide the opportunity to show and discuss cutting-edge contemporary art exploring Jewish themes and related to current issues. The Salon organizes exhibitions, panel discussions and educational & other art programming with leading international artists and scholars, in order to create an appreciation for innovative Jewish art in the contemporary art world. Its initiatives reach out to both the Jewish and non-Jewish community.